Hello, hello, friends! Long time no see. My sincere apologies for the long blog absence last week. I woke up Tuesday with the worst double ear infection I've had in years and it totally knocked me out of the game. Phew! It's still hanging on today but at least my head no longer feels like a water-filled balloon haha. 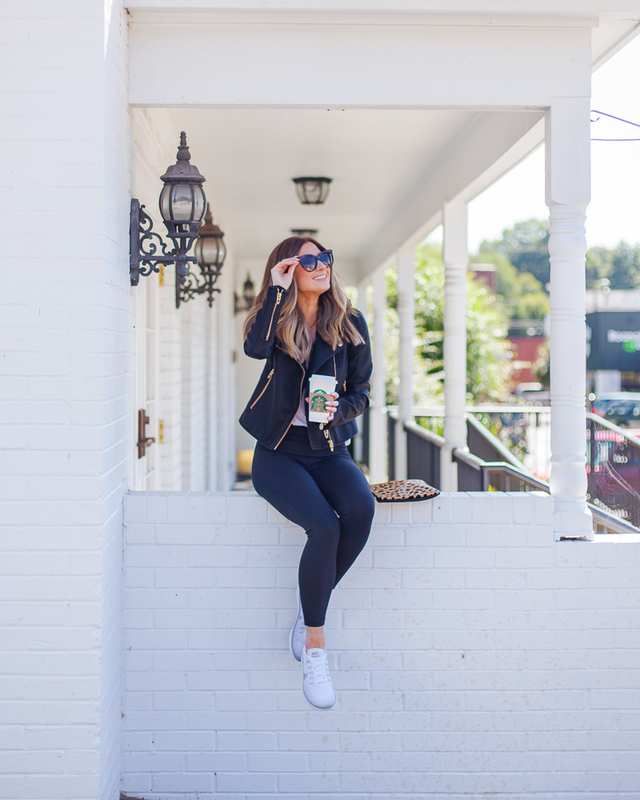 I've been meaning to share this fun monochromatic, a little bit edgy, fall-inspired athleisure look for quite some time now. I snagged this hooded leather jacket (under $100) in August and have been praying for cooler temps so I can start wearing it regularly. And how cute does it look with a simple white tee, leggings, and sneakers?! Definitely planning to share more athleisure wear in the coming weeks. I've gotten a ton of questions about the leggings I wore for these pictures. They are amazing! And yes, they are the midi length. Since I'm only 5'2" they hit me more like a regular length legging which I really like because it's a hard thing for me to find. Currently, this exact pair is sold out in black and available in navy, BUT LUCKILY it looks like they remade a new version that looks almost identical. I own eight pairs of leggings by this brand! My white tee is one of the most practical pieces I own and super affordable at $17 (they just came out with a camo print too!). Having several white tees in your wardrobe is a must - there are so many ways to style them and they go with just about anything. For example, if I want to wear an athleisure look to run errands around town and I don't intend on actually working out, I will opt for a comfy tee instead of a tank and sports bra. It's a great way to wear your workout gear more than just to the gym. My white sneakers are from last year but I linked two pairs that are almost identical - one of which I even like better lol. I know a lot of people shy away from white because of dirt but I simply stain stick mine, place them in a mesh machine wash bag and throw them in the washer. They come out super clean every time! They are really comfortable for every day, no sock wear and have never given me blisters (thank goodness!). And for a little fun and a pop of print, I grabbed my $45 leopard clutch. I seriously love it so much because it's easy to get into, affordable, and easy to dress up. My mom even bought one for herself! Super versatile and great if you don't want to tote around a bag on your coffee run. Oh, btw! The hood of my leather jacket is removable and also comes in green and tan! I love black on black! I have a drawer full of workout leggings that I don't even workout in. My leggings are for lounging and errand days LOL!